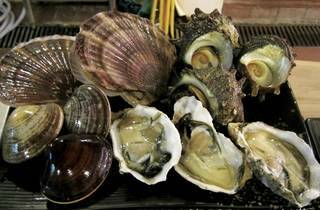 Imagine fat, happy molluscs sitting on a grill, bubbling away in their own brine-slicked juices and you’ll essentially envision what Hamayaki Taisho has to offer. Opened by the folks behind tuna-centric restaurant Doraya, this Tai Hang eatery is decked out like a fish market with deliberately grotty furnishings such as stools fashioned from old plastic crates and plastic curtains standing in the place of a proper front door. The specialty here is barbecued seafood, particularly shelled species that are served fresh and still breathing before they’re thrown on to the portable grills perched at each table. There’s no need for DIY as each grill is assigned an expert who cooks the high-pedigree ingredients with spot-on precision. The set menu ($576) is enough to feed two and can be ordered with an additional sashimi course ($696), which includes three types of the day’s freshest raw shellfish. This can be anything from scallops and frills of arc shell mantle to firm-fleshed geoduck that still carries a tinge of sea brine. Moving on to the grilled segment, large turban snails are first to hit the heat. They’re left to swelter over the flames before the meat is pulled out, snipped into pieces and placed back into their shell with just the bitter liver left on the side. The dark, smoky flesh is a stark contrast to the sweet and succulent scallops that follow. Midway through grilling, the scallop is basted in its own broth then anointed with homespun garlic butter (or barbecue sauce, depending on your preference). Ask the staff for some toasted bread to sop up the residual pool of fat. 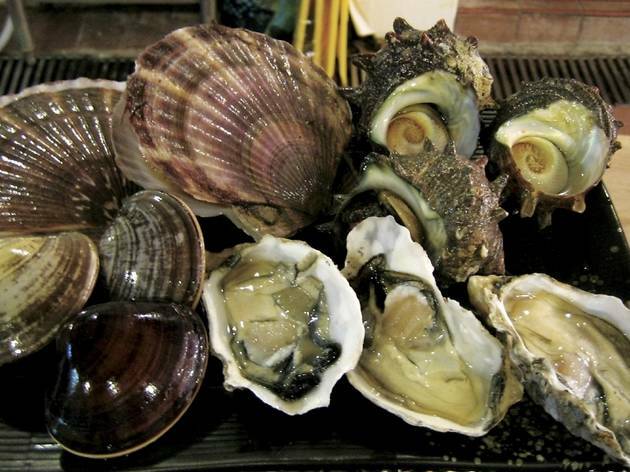 The set menu also includes oysters but it’s the plump clams which catch our attention. These are cooked rare so that the centres still swell with liquid. The staff hands us one half shell first filled with clam juices – it’s sweet with a saline finish. As for the meat, it’s creamy in the middle and crisp around the edges. Delicious. We’ll also rave about the deep-fried octopus that’s housed in a light batter and dusted off with a little spice. It’s followed up by a plethora of grilled skewers, including sea whelk, tuna and leeks, shiitake and squid beaks (crunchy and surprisingly addictive). The set menu ends with a choice between kettle rice and congee. The former is fragrant and gummy, with the rice grains duly plumped up with sweet seafood broth. Outside of the set menu, be sure to tack on an order of crab roe ($72) – a grey mess that’s served in the top shell with a raw quail egg yolk before it’s thrown on to the grill. We could eat this forever. 8 King St, Tai Hang, 2895 5000. Mon-Fri 6pm-11pm & Sat-Sun 2pm-11pm. Dinner for two: around $700.